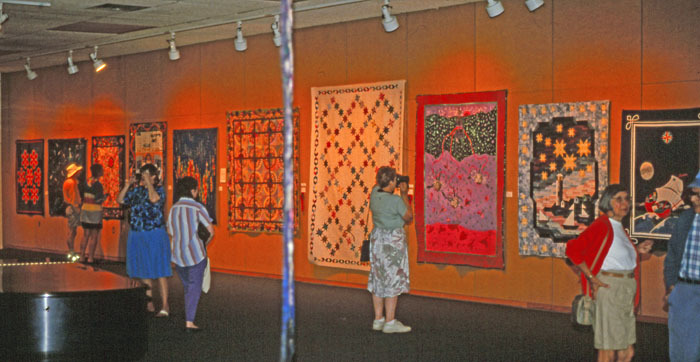 Quilt Canada is back in Halifax, NS this year after an absence of 18 years. 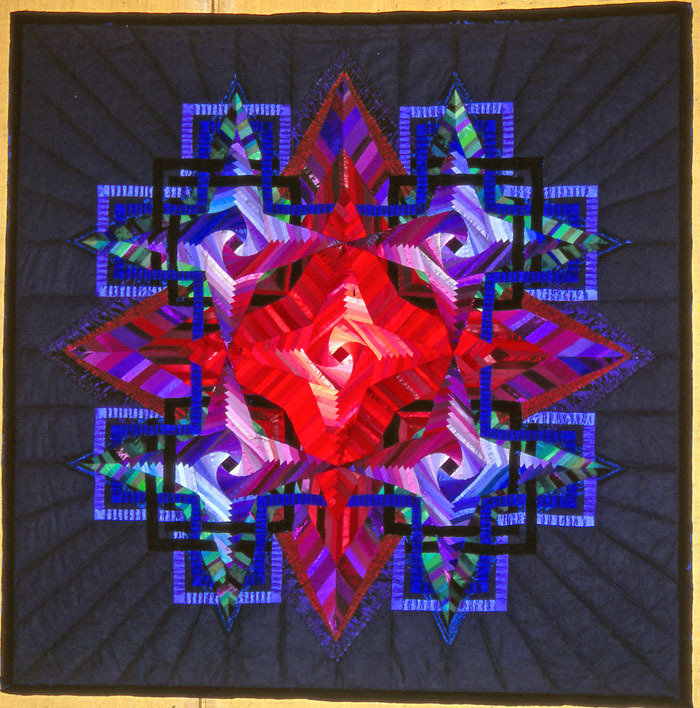 The Mayflower Quilt Guild has hosted the event twice in the past, in 1984 (at Mount St. Vincent University) and in 1994 (at Saint Mary's University. This year it is being hosted by not one Guild but a group of dedicated quilters from the Mariners QG, the Mayflower Quilters Guild and there are representatives on the local organizing committee from several other Guilds in the Province. Doris, Valerie, Ruth, Kathy and Cheryl dressed in our "aprons" ready to go to work The bib of the apron was a block called "Mayflower", everyone had a piece of a blue fabric that had flowers on it that resembled our provincial flower, the Mayflower. Everyone used an off-white fabric and the rest of the fabrics could be their own choice. We were easily recognizable! It was a wonderful conference. Every detail was looked after and all the workshops and events were held on campus. 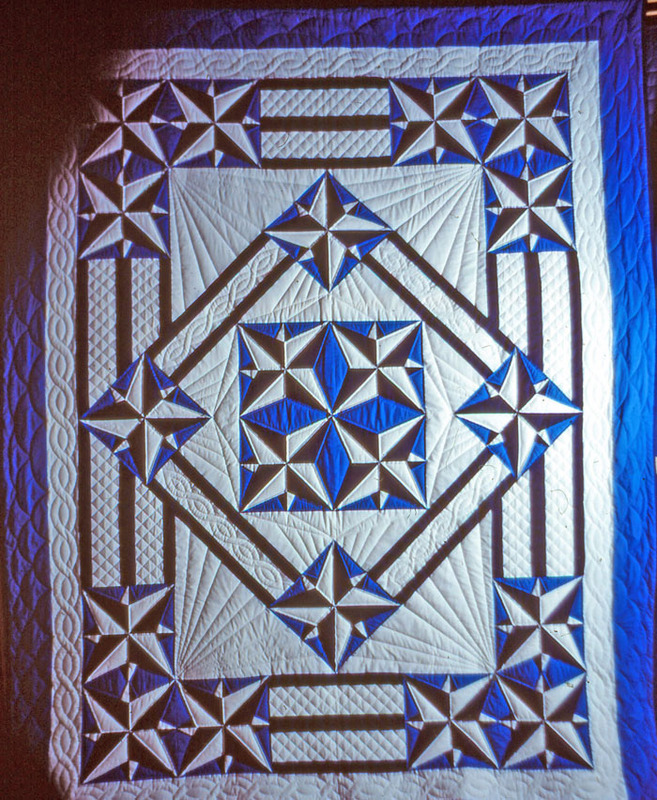 Points East, raffle quilt made by members of the Mayflower QG, machine pieced, hand pieced and hand quilted. My apologies for the quality of the image, they are all scanned slides and are not the best quality! This year's will be much better. The centre block remains to this day as the logo for our Guild newsletter called Points East. My quilt Perseverance was in the National Juried Show but the picture was very dark so this is one taken outside. It was inspired by a Frank Stella painting, it was machine pieced and hand quilted. It is now in the Nova Scotia Art Bank. 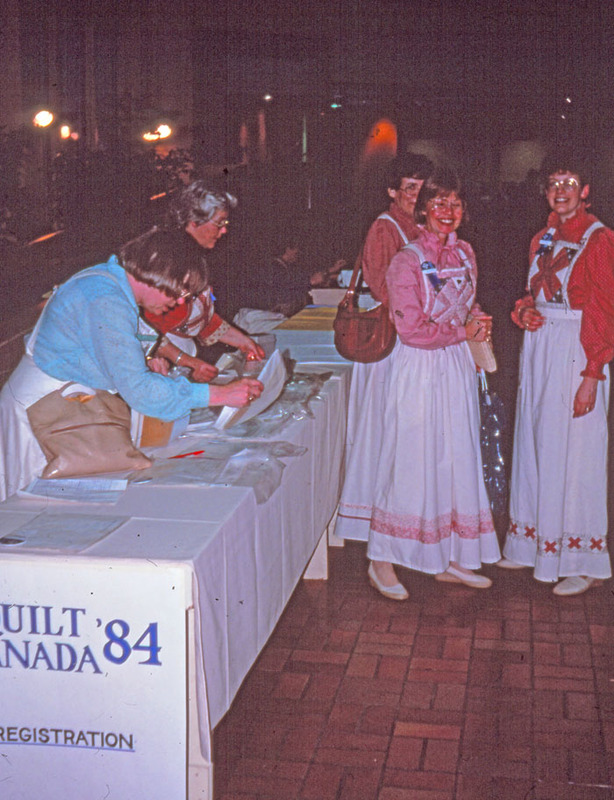 We had so much fun hosting quilters from all across Canada and beyond that we volunteered to host it again in 1994. The National Juried Show had a theme that year "Heavenly Bodies". It was held in the Art Gallery at SMU. Both this show and the one in 1984 broke all the records for attendance at both university art galleries! The Art Gallery was busy all the time! Meredith Annett's Northern Lights Through My Window. Be sure and watch for Meredith's entry in this year's show, it is wonderful. Linda Mackie Finley's Linnet's Dream. And Linnet, Linda's daughter is making quilts and other wonderful things for kids which you can find here. I am sure we will see one of her quilts at Quilt Canada one day soon. I have met many wonderful quilters over the years at various Quilt Canada's. Some of them will be back in Halifax next week and it will be great to reconnect again. Though I am not on the local organizing committee this time, I am very excited to be teaching 3 workshops. I can't wait to meet my students, see all the many shows that will be around the university and at a few other sites close by and of course visit the Merchant's Mall. Welcome back to Halifax Quilt Canada!